Antonius, a common Roman civilian comes back from a long, hard day in the fields to sell his goods at the Forum Romanum. Rome never has a normal day, but today is even more eccentric, as today, the Colosseum is bound to open. 1. Please only play the scenario on standard difficulty. The scenario relies on game mechanics that break on higher levels. 2. As it is a puzzle scenario, only 1 difficulty level is available. If you want to make it harder, you can play without reading the objectives. The in-game dialogue should provide you with enough information. 3. The scenario has background music and dialogue, because of that, it is advised to play on normal or slow speed. 4. Save after a puzzle! "The Colosseum" is a puzzle scenario with several challenging puzzles to solve. When it works it's a lot of fun, such as when you let loose a pair of elephants on the Emperor. Unfortunately the scenario has some bugs: it's possible, for example, to enter the tower with Germanius without taking the keys from the Sagitarrius, thus setting off triggers that aren't supposed to go off yet, and having dialogue bits with Germanius playing even after he's gone from the game. All in all it's fun, but it could've been better had the bugs been fixed. Judging the balance of a puzzle scenario is tricky, as a puzzle requires more than micromanagement and war tactics from the player. What you're basically judging is how much thought, knowledge and reasoning the average player has to put into each puzzle to complete it, if this level is reasonable, and if the puzzles make sense. Most of the puzzles in this scenario were well-balanced in this regard. The first puzzle, where you have to find your way into the city, was not unfortunately, due to the bug that makes it a lot easier to finish. I also thought the final puzzle was pretty nonsensical: the main character talks about an abandoned siege engine he saw somewhere, but there is no such thing on the entire map; it also seems highly unlikely that the Emperor would go drink from his water supply immediately after it was bombarded with strange rocks. It's a nonsensical way to win and it seems like an arbitrary solution rather than a well though-out puzzle. Also, when you're walking around the city in armor, it's nearly impossible to survive, as the guards attack you and follow you around wherever you go. The puzzles and the gameplay is pretty creative: for example, having to scare away elephants with fire was a pretty inventive trick. The high point here, though, is the voice acting: every line of dialogue is spoken as well as written, and even though the fake Italian accent can be a bit jarring at times, it's still a big plus for the scenario. 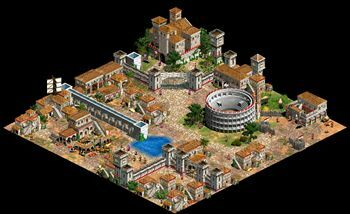 The scenario looks good, and the Italian building set is put to good use to create a believable Roman city. Nothing stands out as amazing, but the map is still solid, and above average. To put it bluntly, the story makes no sense. The main character arrives in Rome to sell his crops, and then out of the blue decides to assassinate the Emperor for no apparent reason. The motivation for his wrath (the Emperor built the Colosseum where his old family home used to be) is pretty weak and not well-conveyed, as the main character is forgettable and has little to no personality. The instructions, on the other hand, are generally good and helpful; the only time I was lost was when the scenario bugged out on me, and that doesn't drag the score down here. For some reason I can't garrison Germanus without killing the Sagittarius first though, no idea how that happened to you, for me he just gets stuck on the house that is placed on top of the tower. (and is removed with triggers once the Sagittarius is dead). A few instructions would be nice or hints. How the hell do I get into the city? There is no-one to talk to in the tiny area I'm stuck in. I can't get though the gate because I only have 1 denari and the only person to talk to is the guard.